I wrote about some of the on-going work happening in the Kubernetes Cloud Provider Special Interest Group and what’s ahead! I spoke about vendor neutrality in Kubernetes at KubeCON + CloudNativeCON Seattle 2018. As the number of cloud providers supporting Kubernetes continues to grow, we’ve had to make some significant changes in the project both technically and organizationally. 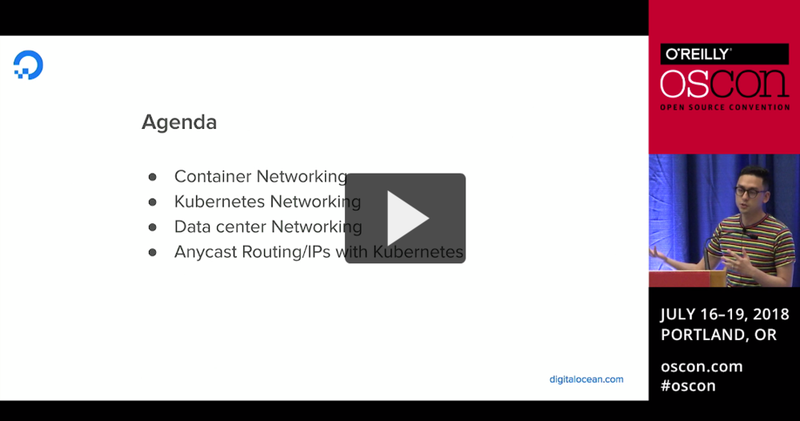 This talk outlines a lot of the work I’ve been doing as a co-chair of the Kubernetes Cloud Provider SIG. Here’s a talk I gave at OSCON 2018 in Portland! This might interest you if you are curious about container networking in the data center! Please reach out (@a_sykim on Twitter) if you have any follow up questions! A bit overdue, but figured I should post my talk from KubeCON + CloudNativeCON EU 2018 here. My talk was about how DigitalOcean uses BGP to deploy Kubernetes Services as global anycast IPs in our data center network! Feel free to reach out on twitter (@a_sykim) if you have any follow up questions! Based on recent discussions, I’ve noticed some confusion around external traffic policies for Kubernetes Services. This is not surprising given there’s a lot of context around this feature that can only be found by digging through many Github issues and pull requests. In this post I'll try to do a deep dive into this feature to clarify some of the important assumptions that may not be clear in the API or the documentation. Turns out you can use good old BGP to power your Kubernetes network! In this post I’ll cover how to build your Kubernetes network with BGP and how to use BGP for traffic engineering in your Kubernetes clusters! My hope is that this post gives you enough context to use BGP in your own Kubernetes clusters (where it makes sense), especially for those who are running Kubernetes on-premise. Open Source at VMware & Kubernetes maintainer.